The Victory Fund is providing support and endorsement for two county-level races in Michigan for the 2012 election: Kevin Howley for Oakland County Executive and Craig Covey in his bid for re-election to the Oakland County Board of Commissioners. The Victory Fund endorses qualified, committed openly LGBT candidates who can win at the ballot box, and gives candidates a vehicle through which to raise money online. Howley is one of the Victory Fund’s Focus races this year, meaning that it is one of about 20 that are positioned to get national attention. He faces Republican L. Brooks Patterson, who has held the position for the past 20 years. “Oakland County, Michigan, is the state’s second largest county (1.2 million people) and blossomed in the 1950s, 60s and 70s thanks to the amazing growth of the auto industry. Lack of planning and an undiversified economic base have left Oakland County stuck in neutral after having lost 175,000 jobs from 2000 to 2010,” says the Victory Fund website. With a fresh perspective and a background in business and in helping struggling nonprofits recover, Howley hopes to bring new leadership to Oakland County. He has served as Interim Executive Director of Affirmations, Ruth Ellis Center and Friends Schools of Detroit when those organizations needed transitional leadership. But he’s also a seasoned private sector business administrator who, among other successes, was the second-in-command of the largest envelope producer in the world. Craig Covey is running for Oakland County Commissioner for the newly-created 18th District, representing Hazel Park, Ferndale, Royal Oak Township, part of Oak Park and Huntington Woods. Thanks to a series of laws that turned power of redistricting over to the Republican majority on the Oakland County Board, Covey has been pitted against fellow Democrat Helaine Zack of Huntington Woods for an August 7th primary. 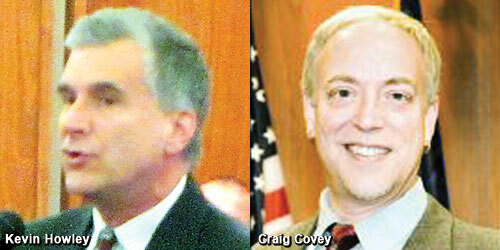 For the record, Howley is remaining neutral in the County Commission primary races. For more on Kevin Howley, check out his website at http://howleyforexecutive.com/. His page on the Victory Fund website is http://www.victoryfund.org/endorsed_candidates/profile/candidate:647. For more on Craig Covey, check out his website at http://www.coveyforoakland.com/.